Looking for the best Tampa Facials? The Grand Beauty Spa has a facial to treat virtually any concern. Each customized facial is targeted to pamper, beautify and correct. Thalgo is an anti-aging specialist and offers facials for different ages and anti-aging concerns, all renowned for their incredible results. For a more radiant and firmer complexion, customized facials are recommended by age. Grand Beauty Spa specialty facials enhance the look of your skin, encourage rejuvenation, and reduce the appearance of fine lines.Innovative masks and serums are used to exfoliate, tighten and revitalize your skin. 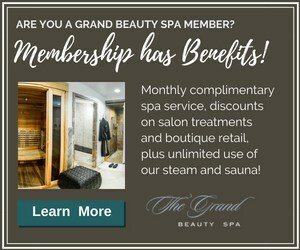 The Grand Beauty Spa offers a comprehensive range of advanced therapies specifically geared toward signs of early aging caused by the environment, pollution and sun exposure. You and your therapist will choose the treatment specifically formulated for your needs and concerns. This personalized facial guides you down the path of the ultimate skin care regimen. The Grand Facial begins with Thalgo’s “Discovery of the Sea” massage to ease tensions and immerse you in a relaxing aquatic cocoon. Designed with the highest standards of cleansing, exfoliation, extractions, facial massage, mask, hydration and UV protection this facial treatment soothes, tones and nourishes your skin …. You’ll love this facial. Its one of the reasons The Grand has earned the reputation for Tampa’s best facial. For best results, The Grand recommends a course of 6 facials, in conjunction with the accompanying home care range to continue effectiveness. …Please enjoy our elegant and beautifully appointed Tampa spa facility including infra red sauna,. steam room, and relaxation areas as part of your experience. Entrust your skin to the expert hands of a Grand Beauty Spa aethestican for an infusion of radiance and ultimate relaxation with Thalgo’s Illuminating radiance Facial. The Thalgo Laboratory has unlocked the secret to perfect radiance with this Facial. A relaxing welcome massage is followed by a Discovery of the Sea Cleansing Ritual and Exfoliation. Then, the Ultra Radiance Mask combines anti-dull complexion and anti-fatigue aspects of selected ingredients to restore ideal light diffusion, followed by an energizing digitpressure massage.